The current difficulties surrounding France’s sale of two Mistral-class helicopter carriers to Russia mark another awkward chapter in the country’s history of arms sales. 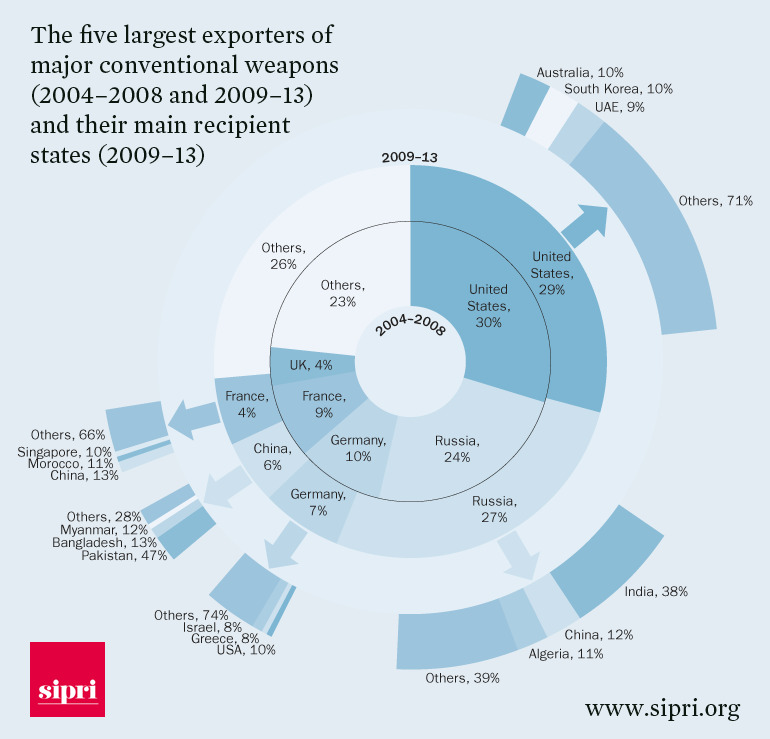 France currently ranks fifth among the world’s largest arms exporting nations, according to the independent Stockholm International Peace Research Institute (SIPRI). The country accounted for 4% of global exports between 2009-2013, down from 9% between 2004-2008, placing it behind only the US, Russia, Germany and China. Although France is by no means the only country to have a checkered history with regards to arms exports, it nevertheless has made some significant missteps in recent history. And the memory of these might help explain, at least in part, the French government’s hesitation over handing over the first of the Mistral warships to Russia while the crisis in Ukraine rumbles on. Here are a few of France’s least-proud moments. 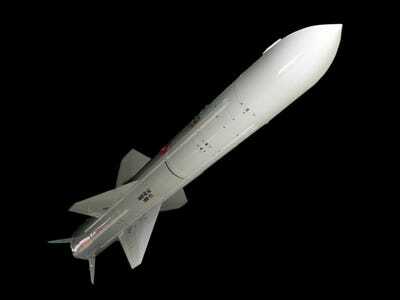 Wiki CommonsAn Exocet anti-ship missile. In the early 1980s the French-built anti-ship Exocet missile, which skims over the water at a height of 1-2 metres, making it hard to detect by radar and difficult to hit with conventional arms, was much in demand. According to reports it had been ordered by 25 nations, including Iraq, Peru, Pakistan and Syria as well as Argentina’s military junta that had seized power in a 1976 coup. By 1982 France had supplied five of these missiles to the country. Then on April 2, 1982, Argentine forces invaded the Falkland Islands, which had been held by Britain for 150 years, beginning the Falklands War. France’s then President Francois Mitterrand responded to the invasion by declaring an embargo on any further French arms sales and assistance to Argentina (although later reports suggested a French technical team remained in the country to ensure that the weapon system was in working order). But the presence of the Exocet missiles remained a major concern for British military commanders. Their fears proved well-founded. On May 4th one of the Exocets hit the British destroyer HMS Sheffield, killing 20 of her crew and sinking the ship. The sinking of the Sheffield was a high-profile demonstration of the Exocet system’s effectiveness, and may actually have boosted demand for the missiles. One customer in particular took a keen interest in acquiring them — Iraq. The Iraqi leadership regarded the aircraft as the ideal weapons system to launch an effective attack on the Iranian terminal in Kharg and oil traffic to Iran. The Dassault company…offered to sell the Iraqis twenty-four of the Mirage F-1 fighters that had been upgraded to carry and fire two Exocet missiles each…In the meantime, the French government agreed to ‘lease’ Iraq five Super Étendard fighters from its own naval inventory. Unfortunately the deal rocked the already delicate relations between Iraq and its neighbour Iran, with the Iranian leadership indicating that it would amount to a casus belli if the planes were delivered. Undeterred, the French government pressed on launching “Operation Sugar”, whereby five French fighter pilots employed by the Dassault company equipped with false passports secretly flew the five jets to the Qayarah West base in northern Iraq, according to Razoux. The flight included having to refuel on a French aircraft carrier based off Cyprus and a brief stop-off in Turkey before flying along the Turkey-Syria border at low altitude to avoid Syrian radar. Whether the delivery was spotted or not by Iran remains unknown, but two weeks after their delivery a truck bomb hit a building in the Lebanese capital Beirut where a contingent of French paratroopers were stationed. The French authorities believed the attacks were ordered by Iran. Over the next few years France delivered 29 Mirage F-1s to Baghdad in deals that were worth as much as $US500 million, some of which was paid for with crude oil according to the US Library of Congress. While French aircraft were used extensively in the 1984 tanker wars between Iraq and Iran, these same aircraft became a major problem only three years later. 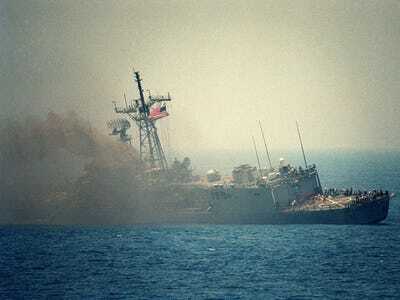 Wiki CommonsUSS Stark after it was hit by two Exocet missiles. 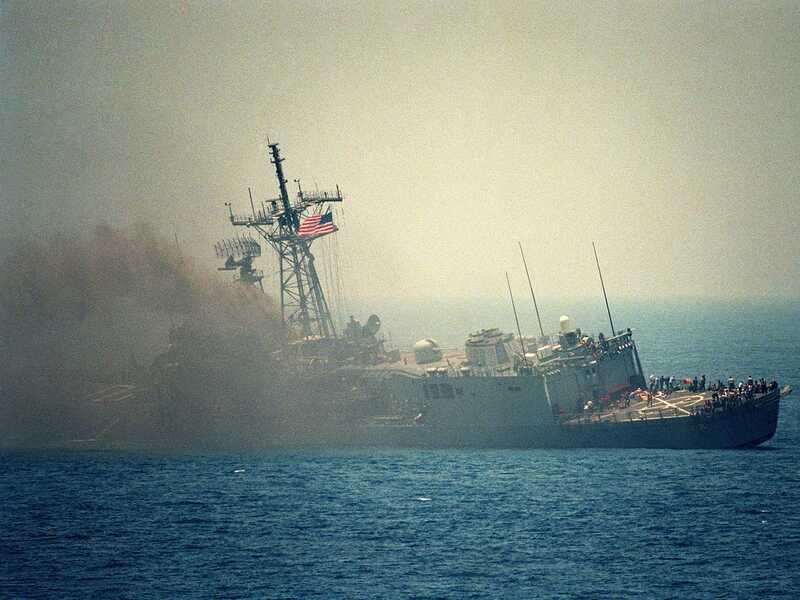 On the night of May 17, 1987, the USS Stark was hit by two Exocet missiles fired by an Iraqi F-1 Mirage jet. In the words of a US Navy report the attack was “unprovoked and indiscriminate”, as the Stark was in international waters at the time. It resulted in the death of 28 crew members, although the ship itself was rescued after its crew fought a blaze that lasted for 24 hours. In October 2004, the European Union ended 11 years of sanctions against Libya. In particular, the deal included easing an arms embargo in exchange for a commitment from the Gaddafi government to give up the development of weapons of mass destruction. That deal paved the way for European arms dealers to rekindle their relationship with the country. And so they did. Between 2004-2009 the EU granted export licenses for €834.5m worth of arms and ammunition to the former Italian colony. The vast majority of this was provided by Italy, Germany, the UK and, of course, France. 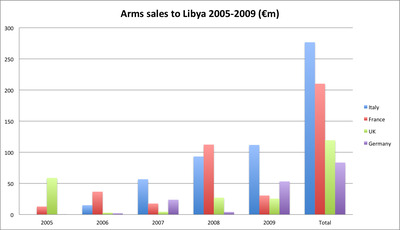 Europa/Business InsiderTotal arms sales to Libya between 2004-2009. Perhaps unsurprisingly considering their shared history, Italy was the largest provider of arms to Tripoli in the five years after the end of the embargo, selling around €277 million worth to the country. However, France came a close second with just over €210 million worth of military exports. Once again France’s hold on the military jet market was in evidence, with the country securing €126 million worth of contracts with Libya pipping Italy as the largest supplier of planes over the period. Furthermore, it was also the largest supplier of bombs, rockets and missiles to the former pariah state. 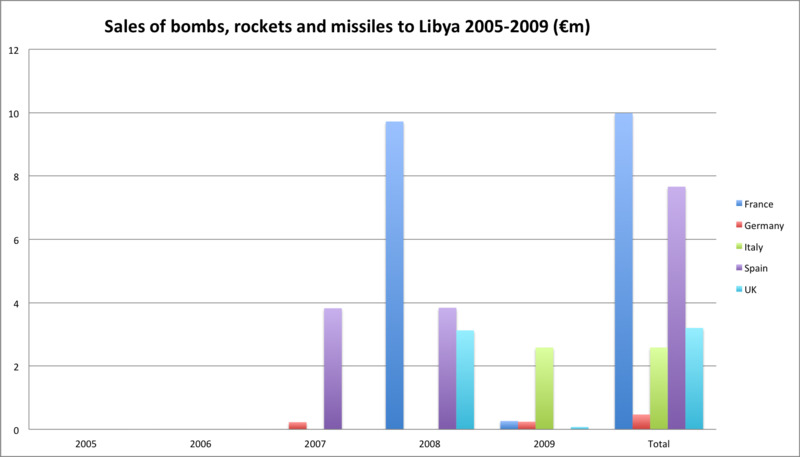 Indeed in 2008, France sold just shy of €9 million worth of munitions to Gaddafi. Three years later the West, with France among the leading protagonists, was drawn to intervene in Libya as the country descended into a brief but bloody civil war that saw forces loyal to Gaddafi fire into residential neighbourhoods. Although there is no suggestion that any of the countries that supplied arms to the country could reasonably have known what would transpire, it was a stark reminder of the risks inherent in these types of deals with potentially unstable states. As the charts above show, France is far from the only country that has seen arms deals come back to bite it. Yet with all of these awkward historical examples, it is perhaps no surprise that French President François Hollande has proven reluctant to OK the sale of the Mistral ships while the situation in Ukraine remains so unstable. This will be of particular concern since the second of the two ships, the Sevastopol, is due to join up with the Russian Black Sea fleet based in the (recently annexed) Crimean port of the same name. With both sides in the Ukraine conflict seemingly unable or unwilling to stick to a ceasefire deal, Russia may well be waiting a long time yet on its order.